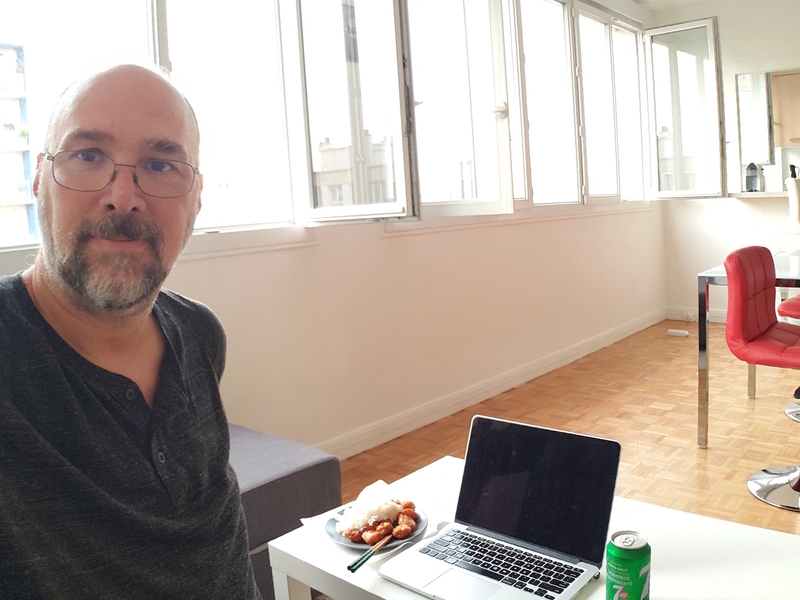 Paris, end of Week 1 – Planet Geek! So it’s Friday, I have made it through my first week in Paris. All in all, things are going fine. My new apartment is comfortable and easy to deal with. I’m quite close to the Metro station I use to get to the office (half a block), and the ride is about 20 minutes. I’ve mostly shifted sleep schedules (though for some incomprehensible reason, i couldn’t sleep well last night. Not sure what was up with that). I’m trying very hard to get as much French and city culture into me as possible, but I fall back on comfort food and headphones when it gets overwhelming. There’s a lot of simple restaurants around the apartment that have been great for “tonight I’ll just have X” for food. Supermarkets are no problem, though sometimes it’s hard to decipher food labels. For example, milk. “Lait entier” is whole milk, “demi-écrémé” is the equivalent of 2% (it’s closer to 1.5, but whatever), and “écrémé” is skim. Almost always sold in 1 liter bottles (I have yet to see the depth-charge sized GALLON milk jugs so prominent in the US. There’s whole volumes of stuff I’m learning about paris, france, the people and the country. So far I’m enjoying it, though I do miss home. My coworkers are helping me enormously with my French, and if I can get more of that working, it’ll make the whole experience more rewarding. I can feel myself learning the idioms and I feel like i’m on the edge of assembling comfortable dialog, but I’m still in the “groping for the right word” phase. I’ll get there! For map searchers, I’m living in the 15th arrondissment, which is on the western side of the city, about 8 blocks from the eiffel tower (which I can see outside my window every day). I take the metro about 1/3 of the way across the city to go to work. I haven’t missed having a bike or a car yet, though the electric scooters that so many people ride around may be a great way to get around. For now, I’m sticking with the Metro (I have a full 5 zone pass that gets me anywhere in Paris and the surrounding areas, as many times as I like. That’s a huge win). Now that I’m relatively settled in, I’m going to start looking around for ‘things to do’. Volleyball, pingpong, biking, music, art, longer walks – dunno, I need something to keep me active, otherwise I just work all day (this week has been pretty much steady 10-12 hour days). I have another 4 weeks until I have family folk coming to stay with me. I think it’ll be okay, if I can keep my brain occupied and not spinning off into lonely spaces. A wandering geek. Toys, shiny things, pursuits and distractions.